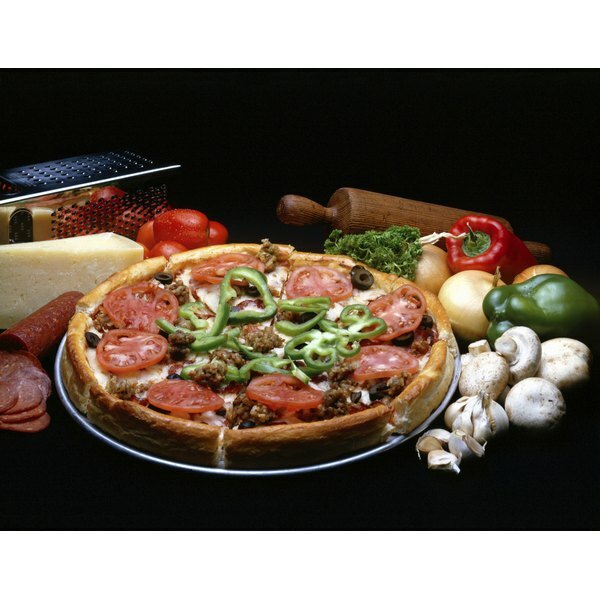 Use prepared or pre-cooked meats when topping pizza. No one likes to bite into a pizza with soggy, uncooked dough or get a mouthful of yummy toppings covering a slab of burnt crust. Baking a great pizza is not one-size-fits-all; cooking times vary depending on the thickness of the crust and a few other particulars. Done right, your pizza will have no resemblance to the Leaning Tower of Pisa. If you start with a pre-made commercial pizza crust, cooking time will be less than if you make your dough from scratch. Pre-made crusts have already been baked and are ready to support toppings. If using homemade pizza dough, don’t go for thin crust. Roll the dough so it is thick throughout and leave a “lip” around the edge. Remember, the thicker the dough, the longer the cooking time. 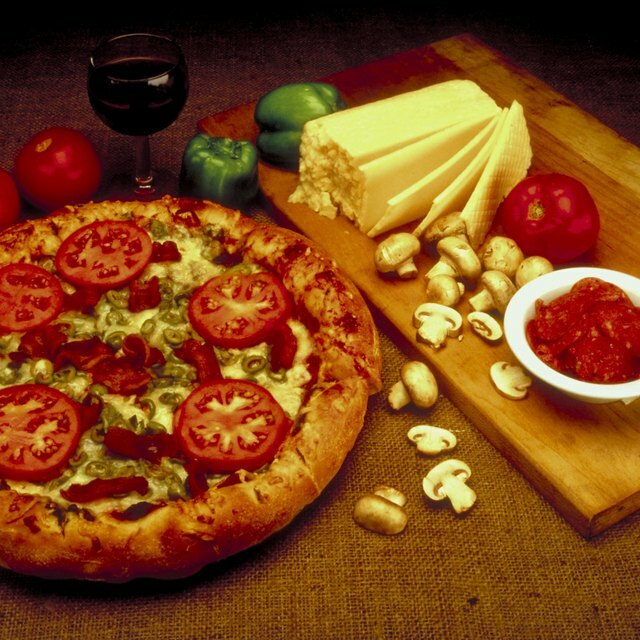 A properly cooked pizza will have a uniformly golden crust. Pre-cook and drain meat such as chicken, sausage or bacon to ensure it reaches safe cooking temperatures before adding to the pizza. When adding vegetables, slice them very thin or saute them for a few minutes before adding to the pizza to shorten cooking time. Juices from raw meat and vegetables add more liquid to the crust and prevents it from cooking. Distribute toppings evenly to prevent uneven browning. A pizza stone can shorten cooking times when making a fully-loaded pie. Place the stone in the oven for 30 minutes before cooking the pizza to ensure the stone is as hot as the oven. The hot stone begins cooking the crust immediately which contributes to a substantial, crispy crust that won’t easily bend when sliced. If using a baking pan or sheet, pre-heat it before adding the pizza dough and allow a few extra minutes of cooking time since it doesn't retain as much heat as a stone. Commercial pizza ovens cook at temperatures over 500 degrees Fahrenheit but they are better insulated than home ovens and cook more evenly. When cooking at home, heat your oven to 500 degrees for 30 minutes and pre-warm the pizza stone or pan. Place the pizza dough on the hot stone, reduce heat to 425 degrees and cook for 8 to 10 minutes, until crust is firm but not brown. Top with sauce, meat, cheese or your favorite toppings and return the pizza to the oven for an additional 10 to 12 minutes. Crust should be golden brown and cheese should be melted and bubbly.